Can You Zig When You Did The Zagging? I first noticed this when Starbucks introduced a major pivot in their offerings. Then last week I discovered Amazon slipped in a very interesting and similar twist to their shipping services. Is it possible for smaller businesses to learn from these behemoths and adapt this twist? I think so. Watch this week’s UNCOPYABLE Business episode and learn exactly what this spin is! 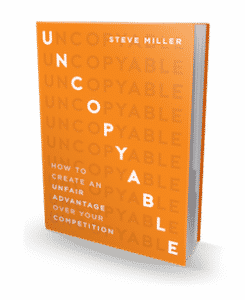 Have you registered for the live Uncopyable Implementation Boot Camp yet? Get information here! Great video, Steve! I love the concept of moving from Disruptor to being an Insurgent Against Yourself. There’s a lot there to consider. Thank you.